Every now and then there's a convergence of a good airfare and a free weekend. 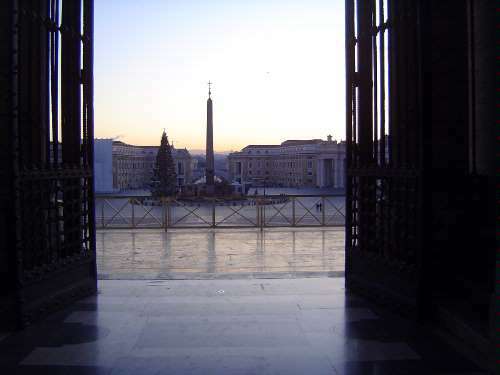 In this case they opened a small window in which to look at a few of Rome's churches. 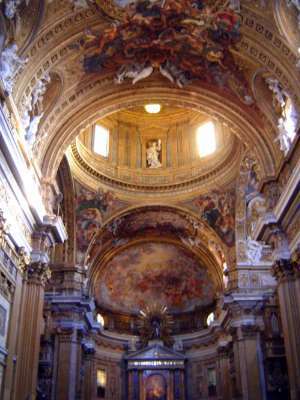 Specifically, we're going to look at a sequence of churches leading to the Gesu Church. Almost by accident, however, we begin here at the Pantheon. Its original purpose is a little unclear today, though the building has been a church since 609. (Services today are only occasional.) The columns have the feeling of an Egyptian temple--a bit of papyrus swamp here on the Tiber. In their standardized dimensions--each one about 40 feet high and with a base diameter of almost five feet--they also suggest Roman efficiency. Each one was dragged and floated from Egypt, and it was all done quickly, with construction completed within a decade. 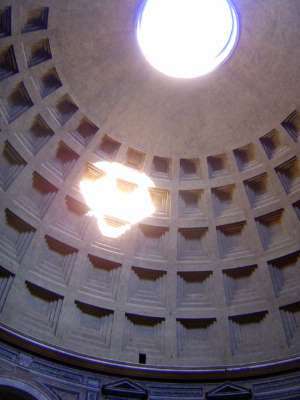 The interior of the dome is a coffered hemisphere. Counter-intuitively, if an inflatable ball were filled to fit the dome the ball would also just touch the center of the floor. 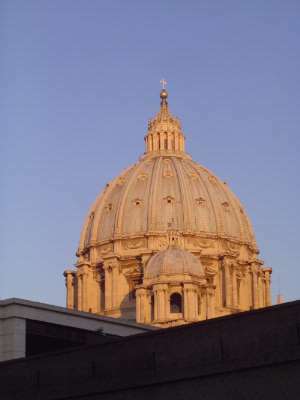 This is still the largest dome in Rome and at 43.3 meters is just a bit wider than the dome of St. Peter's. Hadrian's builders poured some 5,000 tons of concrete--a mixture of lime and pozzolana--over a temporary wooden frame. That dome (the so-called "tortoise shell") was not quite spherical, so its inner face was filled to create the desired curvature and fitted with the pyramidal "bumps" that would form the coffers. Experts emphasize that the building was innovative in a more subtle way, too, replacing the Greek emphasis on buildings as sculptural forms, built to be admired from the outside, with a new emphasis on buildings as the creation of interior space. Serlio, a Renaissance writer on architecture, called this building (in L'Architettura) "the most perfect piece of work I ever saw." He didn't see quite what we do: at the base of the dome the blind windows and panels date from the 1740s. They replaced grilled windows and marble pilasters. From the mighty to the humble, in this case the Basilica of San Vitale. Its position, down a flight of stairs from the Via Nazionale, hints at its antiquity. Since the fifth century, the surrounding ground level has risen with accreted material. 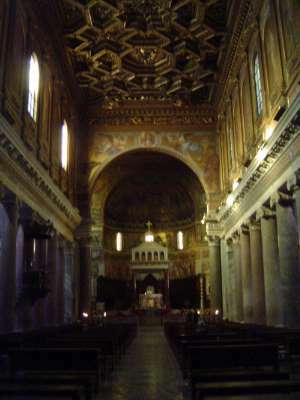 The interior is the early-church form called a basilica. The cheeky comparison would be to a shoebox. In this case the shoebox has been reworked repeatedly in the last five centuries, most recently in 1960. It was this simplest of forms that churches would employ regularly for five centuries before adopting Romanesque, Gothic, and Renaissance forms. 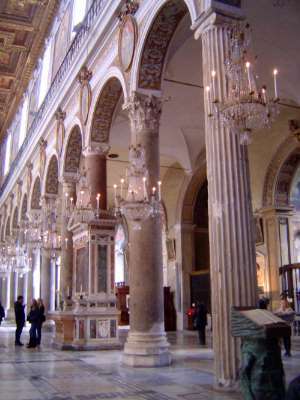 The marble columns of the shoebox are merely painted on a flat wall. The illusion is not very persuasive, but perhaps it does not have to be. Here's another basilica, this one San Clemente, also old enough to have sunk several meters. A grander shoebox. 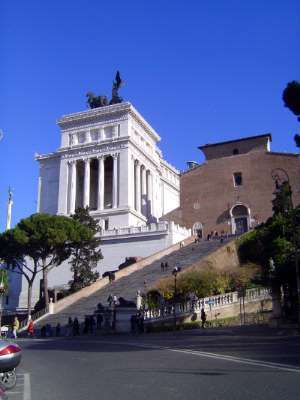 Not the Tomb of Victor Emmanuel, completed in 1911, since when critics have waged war with one another. 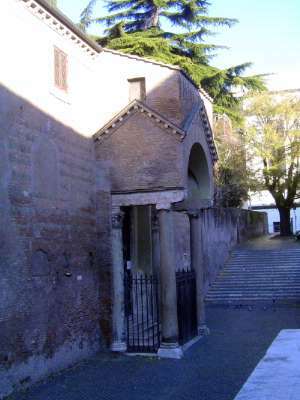 Instead the shoebox is the severely facaded church of Santa Maria in Aracoeli, which stands on the site of another pagan temple, in this case the Temple of Juno. The church was built after 1259, when Innocent IV gave a monastery on the site to the Franciscans. A century later the brutal staircase was added, with not a landing or a bench. Bad design? Maybe for visitors today, but the stairs weren't built for them. They were added by the survivors of the plague year of 1348, who wanted to make the stairs a penance. Apparently there were some souls so grateful that they climbed the stairs on their knees. The interior doesn't have much to do with penance. The insolent might think of it as a Jimmy Choobox. Still, the builders weren't so high and mighty that they insisted on new materials. Instead they recycled ones they found lying around or perhaps attached to less valuable buildings. After all, Romans of the Middle Ages weren't able, like their forbears, to place orders for a dozen columns of Egyptian granite, express delivery. The shoebox form lasted a very long time, but there were occasional experiments with different shapes. The name of this church, which was built in the fifth century, does not refer to a portly St. Steven. Rather, as is clear even from the exterior, it refers to the shape of the building. 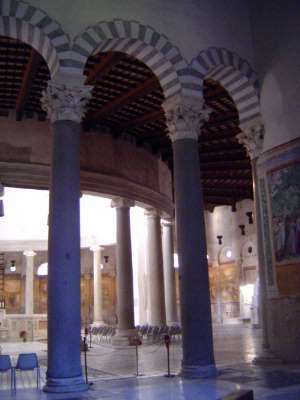 An inner colonnade is ringed by an outer arcade. Another angle. 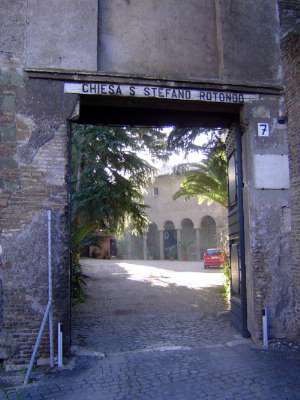 Although the form is elegant, it was not well suited to serve the liturgical needs of the church, and so S. Stefano Rotondo had few imitators. 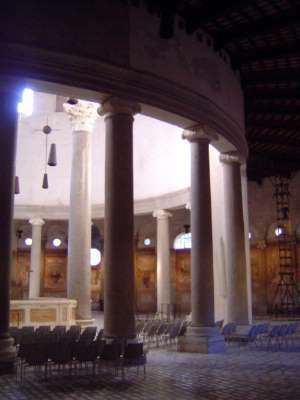 The central rotunda, with a diameter of a bit over 22 meters, is interrupted by a transverse arcade added in the Middle Ages and intended to repair the damage inflicted during an invasion by Normans in 1084 who had come, ironically, to defend the pope. Back to the shoebox, in this case wrapped to kill. 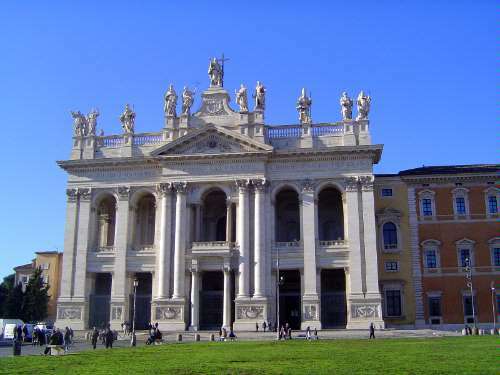 This is the facade of San Giovanni in Laterano. Stefan Grundmann's very useful The Architecture of Rome states that this church is "the pope's real cathedral and is regarded as the mother and head of all the churches in the world, whereas St Peter's, by contrast, is merely the burial church of St Peter and the palace church of the Vatican" (p. 221). 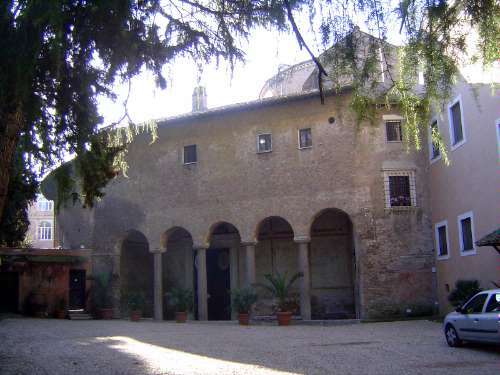 The popes actually lived in the adjoining palace from the fifth century until their departure for Avignon in the 14th. 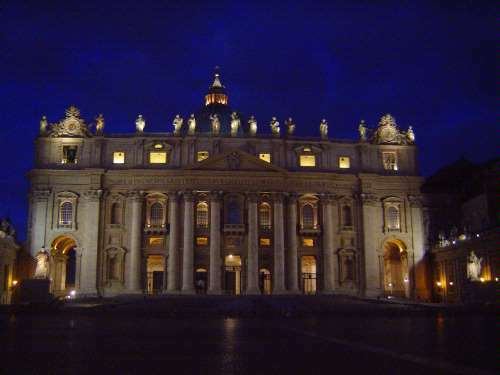 The facade was added in the 18th, long after the popes had returned to Rome and taken up residence in the Vatican. It was designed by a Florentine architect named Galilei, although the aedicule or low wall at the top was added at the suggestion of a Cardinal Albani. (Clients will insist, won't they!) At the top center is a figure of Christ, flanked by figures of St. John the Evangelist, St. John the Baptist, and other saints. Grundmann sees the design as neither Baroque nor Classical but rather a fusion of the dynamism of one and the static grandeur of the other. Sullivan is more inclined to see it like a bank headquarters. In his own words, the building is "monumental rather than complex... not exactly exciting, but... marks the beginning of a new era...[in which the] Neoclassical style was to dominate" (p.284). 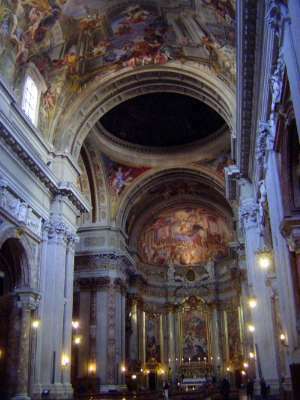 Sullivan is especially unhappy with the interior, calling it "large and demoralizing--an unhappy mixure of styles that fails to cohere into any sort of unified whole....[as though the church is] carved up by architectural treaty... [into] a gothic baldacchino, baroque nave, renaissance ceiling, medieval floor and apse." Grundmann sticks closer to the facts and points out that the famous architect Borromini in the 1640s reinforced the walls by removing columns and putting in their place the massive piers seen here, trimmed with wall panels edged by floor-to-ceiling pilasters. One last basilica, this one S. Pietro in Montorio, on the other side of the Tiber. The form is familiar by now, which raises the question: why come over here? The answer is next door. Bingo! 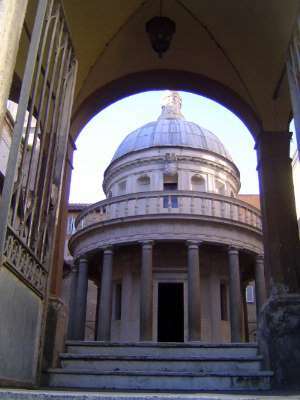 Bramante's famous Tempietto, or little temple. Keith Miller, drawn here because he is looking for the architectural roots of St. Peter's, writes: "Many people would unhesitatingly describe the Tempietto as the most beautiful building in the world" (p. 63). Grundmann is hardly less admiring: "It is impossible to assess too highly the significance which Bramente's Tempietto... possesses for Roman Renaissance architecture" (p. 124). For a visiting barbarian, all this gushing may seem absurd. After all, there's only a small round room over a small basement room, and the dome looks like a shrimpy version of a hundred city halls, county courthouses, and state capitals. But that's part of the building's importance. Bramante brought classical forms back to life, and they've been breathing ever since. This is the germ, dated 1503, of St. Peter's. It's also the germ from which St. Paul's in London would grow, along with the U.S. Capitol. Dome on a drum, ho-hum, ho-hum. 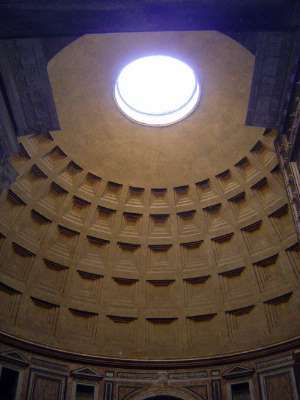 What's less obvious--in fact not obvious at all--is that the diameter of the outer cylinder, resting on the ring of columns, is exactly equal to the height of the inner cylinder supporting the dome. Measure it yourself! The form is virtually a mandala, capped by the dome and (unprecedented in antiquity) a lantern up top. What was it all for? 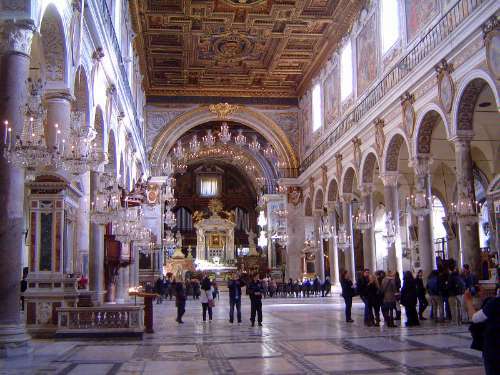 The site was believed (erroneously, it turns out) to be the place of St. Peter's crucifixion. 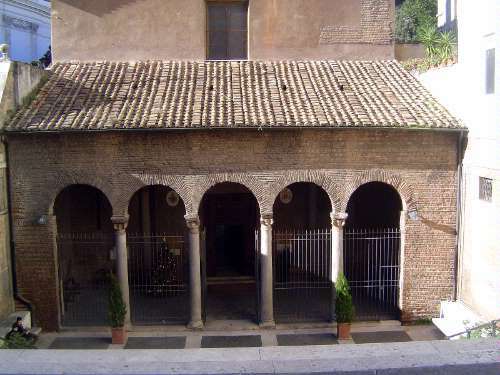 If the siting of the building seems cramped, bear in mind that Bramante called for a courtyard and loggia that were never built. 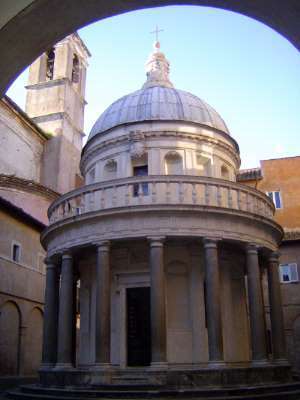 Time for an upgrade, with the cylinder, dome, and lantern of St. Peter's, all obvious descendants of the Tempietto. There were many hands in this dome, most famously those of Bramante himself, Michelangelo, and Della Porta. 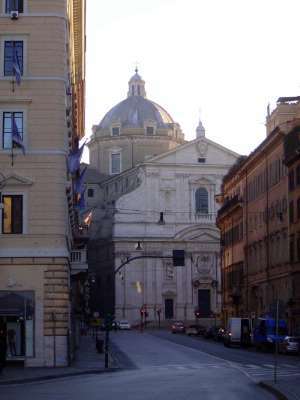 Although Michelangelo's intended dome was hemispherical, Della Porta's--the one built and seen here--was steeper, closer in profile to the dome of the cathedral in Florence. 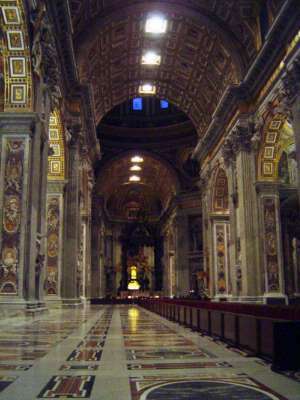 Still, Michelangelo's energy shows up the doubled columns around the drum and lantern, as well as in the 16 ribs of the dome, all of which emphasize verticality. 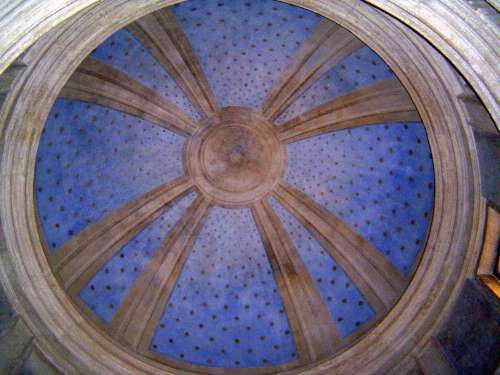 Sullivan once again throws moderation to the wind: "Michelangelo created what is perhaps the most beautiful dome in the world; he also created the archetypical Classical dome pattern that would rule Western architecture for centuries to come" (p. 340). This, despite Della Porta's heightening of the dome. Seen straight on, the dome is less impressive than Michelangelo planned, but it was never part of his idea to have a long nave and a facade like this. 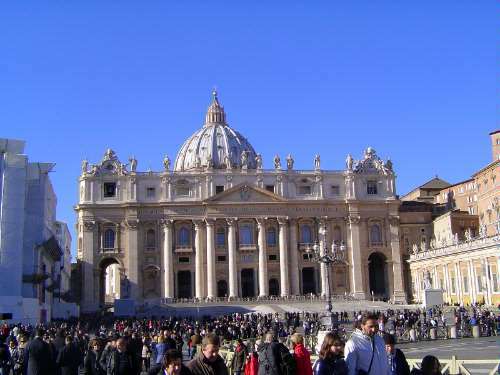 That's all later accretions to the church he planned, which was to be in the shape of a Greek cross, with four short arms extending from under the dome. Anthony Blunt's Guide to Baroque Rome puts it this way: "The addition of the nave finally sacrificed Michelangelo's conception of a great dome supported by a compact Greek cross church, closely related to it in its proportions, and meant that from nearby the dome is almost completely obscured by the facade of the church" (p. 132). 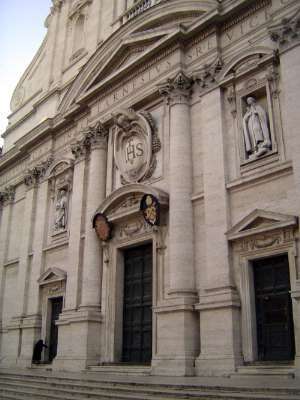 Speaking of the facade, Blunt writes: "This was built by Maderno and the existing structure was finished in 1613. It does not however represent Maderno's complete intention. He planned to have two towers and... extended the front by two bays beyond the width of the church itself. In the event, the towers were never built because when in 1640 Bernini began to construct the one on the left it was realized that the foundations were too weak to support it.... The present aedicules with clocks were a compromise erected by Giuseppe Valadier in the first years of the 19th century...." This all makes Carlo Maderno seem the villain of the piece, but he certainly had no such intention. 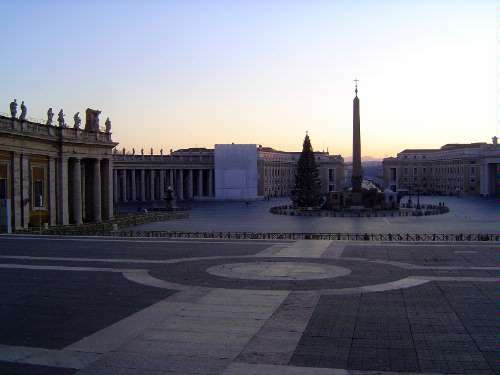 He himself wrote, that "this Vatican Temple being so worthy, so eye-catching, so magnificent as to terrify the most sublime intellect with its very prospect...will last forever, growing greater, for the glory of Our Faith, of Rome and of the whole Catholic World" (quoted by Blunt, p. 140). The view from further back. 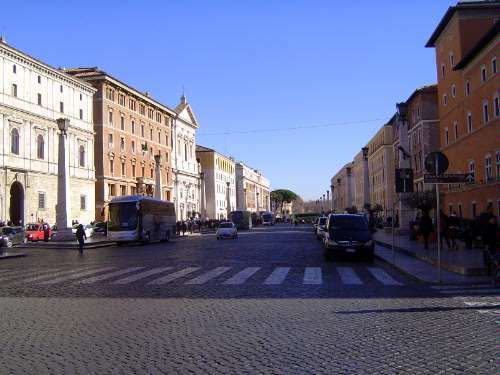 Many cities, most notably Paris and Washington, D.C., have street plans that evolved from Rome's, and Rome's street plan was shaped by Sixtus V, so it is ironic that the approach to St. Peter's should be over a wide but singularly boring street, the Via del Conciliazione. It was ordered up by Mussolini, designed by Marcello Piacentini in the 1930s, and finished after the war. 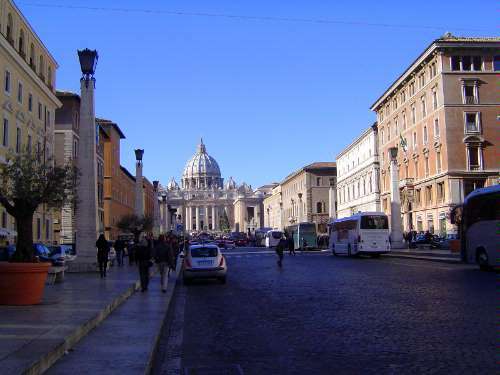 Keith Miller, writing in St. Peter's (2007), calls it "a long boulevard, poker-straight and somewhat bombastic" (p. 6). It's even blander looking the other way, toward the Tiber. The view here is from the church steps and looking down the slightly offset path of the same street. (Thank dawn for the absence of crowds.) The obelisk was set in place in 1585 by order of Sixtus V, but almost a century passed before Alexander VII in 1656 began the development of the site in front of the church. 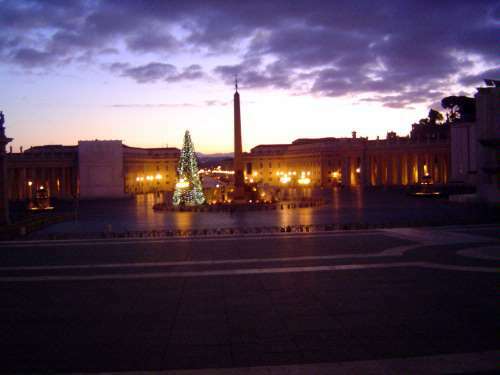 His orders to the architect, Gian Lorenzo Bernini, were to leave the obelisk in place and allow for the assembling of a crowd. 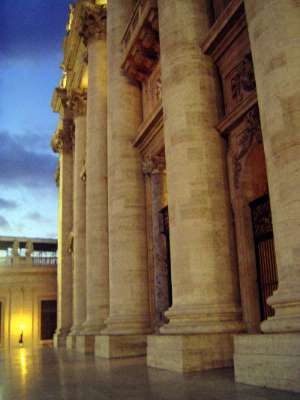 Bernini's famous solution was to create a pair of oval colonnades which, in the anonymous words of a note in the papal archive, formed "a portico which can at once receive Catholics mother-like, with open arms, to confirm them in their belief: heretics, to reunite them with the church; and unbelievers, to light their way to the true faith" (Miller, p. 4). 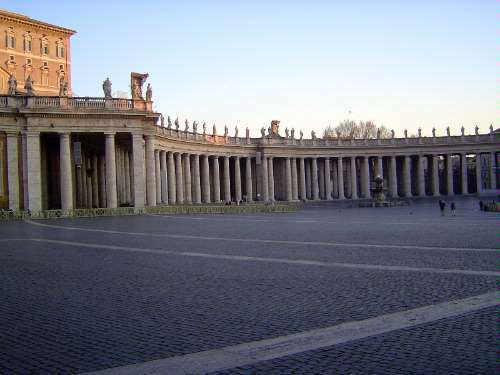 The colonnades, with 284 columns arranged in four rows, form a visual wall to create the illusion of enfolding arms yet remain open so that people may enter freely from any point. Before the construction of Mussolini's street, access had been from a maze of alleys leading to many points along the colonnades. Alexander VII ordered the construction of a straight street leading to the river, but the result was narrow and corresponded to the northern edge of the modern street. There is a gap between the two arms; it was supposed to be mostly filled by a connecting section that was never built. A few minutes later, the space is still almost empty. 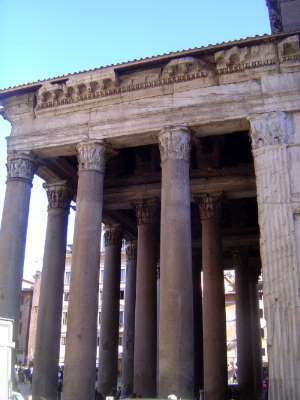 The giant columns up close are a reminder of the building's scale. The barrel vault of the nave presses down with almost the opposite effect of Gothic verticality, and cthe dome is almost lost. 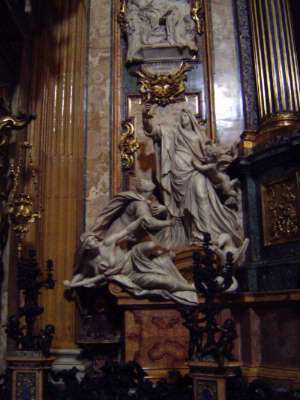 There is some compensation in profuse decoration, executed by an army working for Bernini, who was also the author of the famous baldacchino that stands under the dome. A "bedstead," according to the sharp-tongued Charles Dickens. 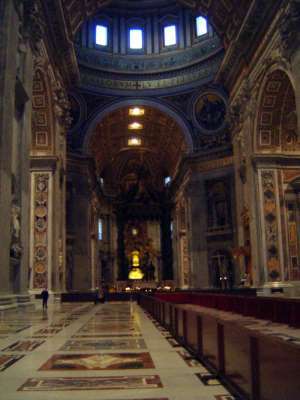 Nominally at least, it stands over the tomb of St. Peter, whose throne is brilliantly lit in the apse beyond. Up a bit closer, the dome begins to appear, as some have said, like the drum and dome of the Pantheon elevated into the sky on four immense piers. Still closer and perhaps beginning to suggest what the entrance would have been like if Michelangelo's plan had been executed. Here's that "bedstead," completed in 1627. A more respectful reading would be this: "In the Baldacchino he [Bernini] solved the problem of constructing an altar which would not be dwarfed by Bramante's colossal order of pilasters by making his columns of dark bronze and giving them the twisted form of the columns which had stood in front of the altar in Old St Peter's and were traditionally believed to have come from the Temple of Jerusalem." Keith Miller reminds us that none of this spared Bernini from John Ruskin's condemnation. "It is impossible for false taste and base feeling to sink lower," Ruskin wrote, and he wasn't the first to feel that way. 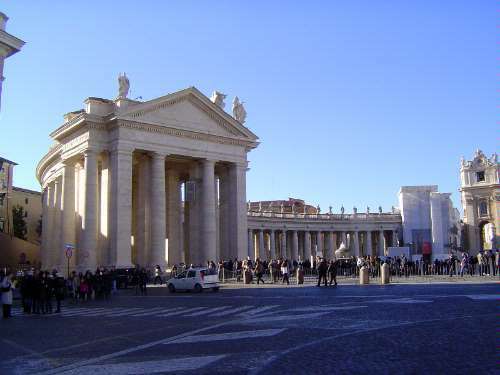 Winckelmann, a lover of classical Rome, wrote that Bernini "singlehandedly... introduced corruption into art." Ouch! 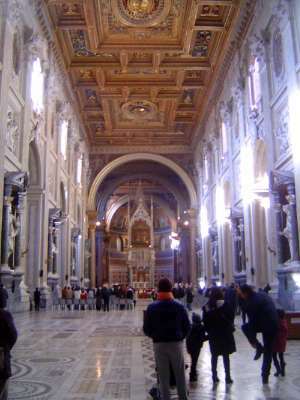 Miller himself simply concludes that "whatever the baldacchino is, and whatever it is for, and whoever designed and made it, it is by pacing around it that the visitor may at last begin to feel he or she has begun to get the measure of St Peter's" (p. 108). 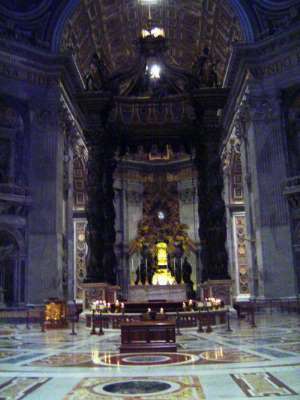 Bernini, by the way, worked carefully by first making two full-sized wooden models, no small undertaking. Set in the floor and easy to overlook is this rota or wheel, perhaps a disc cut from a porphyry column. 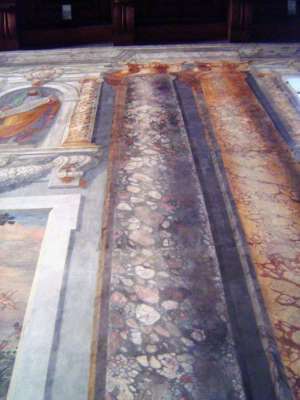 It is a remnant of the four "wheels" in the floor of Old St. Peter's, the basilica begun by Constantine and demolished after 1500 to make room for the new church. There is a similar "wheel" in Istanbul's Hagia Sophia, and the idea of these stones seems to have been imported from there. 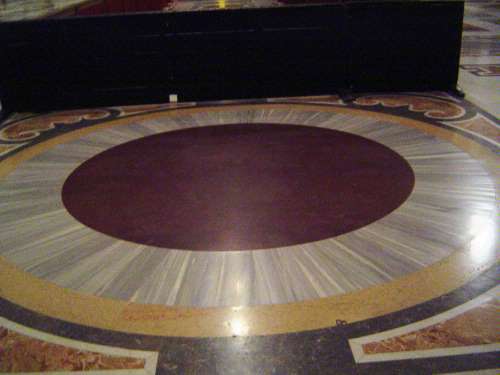 At the old St. Peter's, these discs marked the proper spot for prostrations. The surrounding curlicues are--surprise!--the work of Bernini and are a reminder that this stone, unlike the other three, somehow survived to be put in place here only in the 17th century. And now the Gesu Church, which was the spur to this weekend fling. The draw wasn't the church's prized bone from the forearm of Francis Xavier. It was the shape of the church, which influenced many of the churches built by the Jesuits as the Portuguese Empire spread across Asia in the 16th century. 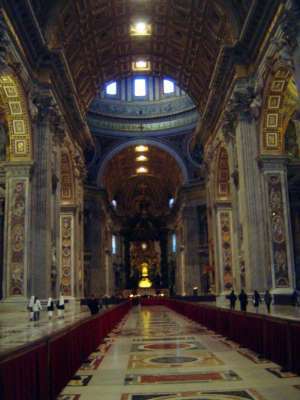 The Council of Trent, meeting mostly in the 1550s, emphasized the importance of sermons, a function poorly served by the form of most European churches of that time, with long, narrow naves flanked by the nearly wasted space of parallel aisles and grand transepts. 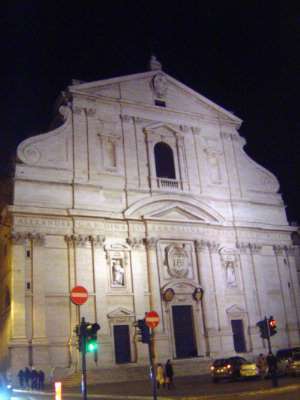 Along came this church, designed by Giacomo da Vignola (1507-73) and paid for by Cardinal Farnese. 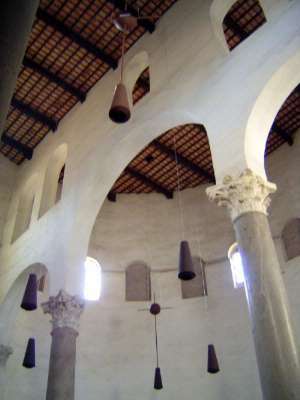 Vignola shortened the transept, widened the nave, and replaced the aisles with chapels. 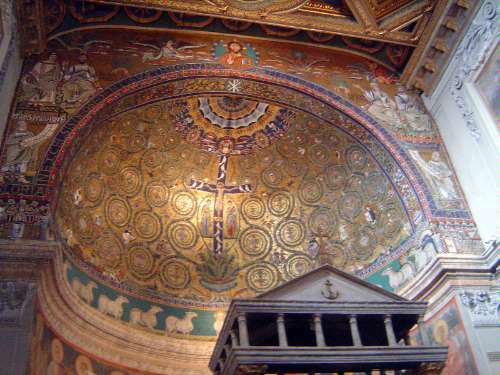 At the same time, he retained the shape of the cross and with a dome allowed light to fall on the apse and transept. 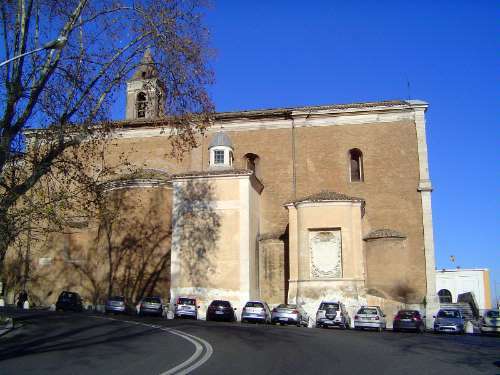 The foundation stone was laid in 1568, and when Vignola died in 1573 work had just begun on the facade. Vignola's plans were replaced by new ones by Giacomo Della Porta (1533-1602), not terribly different from Vignola's but with fuller scrolls derived from churches in Florence, especially Santa Maria Novella. Blunt writes that the result was "more influential than any other Roman church of the later 16th century.... It provided the ideal solution to the problem of binding into a single whole the higher central section covering the nave and the lower side section corresponding to the aisles, a problem which had exercised architects since the 15th century, when Alberti invented the earliest formula in the facade of S. Maria Novella in Florence" (p. 43). César Guillén Nuñez begs to differ. 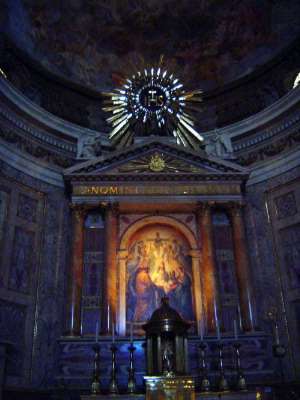 In Macao’s Church of Saint Paul: A Glimmer of the Baroque Church (2009), he writes, "The impact that the Gesu had at the time has led many later researchers and writers astray. In their opinion its lines are discernible in practically all of the main churches inaugurated by the Society, be it in Europe, Latin America or the Orient. Some continue to argue rather wilfully that it is the prototype for the facade and interior of the Church of Madre de Deus in Macao, something which is clearly not the case." Yet and still: the surviving facade of that Macao church does resemble this one, as do the churches of Goa, Bassein, Diu--and Salvador in Brazil. 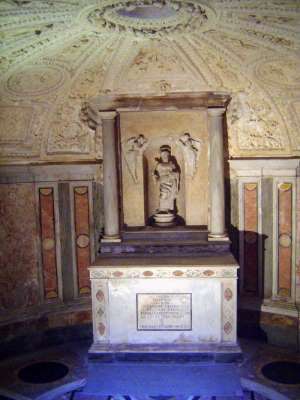 Farnese, like many philanthropists throughout the ages, expected some recognition. The interior of the church was originally austere, but counter-reformation exuberance dictated a makeover in the 1680s. Sullivan remains distinctly unimpressed and writes of "a relentless three-hundred-year onslaught seemingly bent on decorating the place to death... 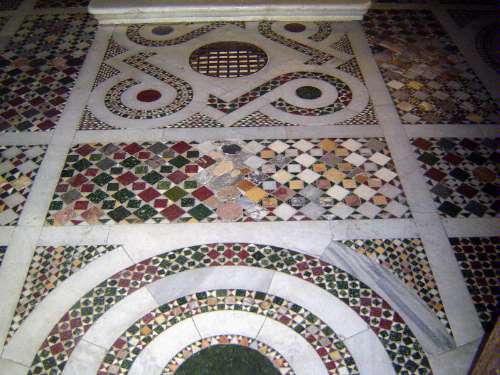 The welter of haphazard ornamentation drains all strength from the interior's architectural elements, and everything mixes and merges and blends until the walls become merely an undifferentiated shell encrusted with suffocating decorative barnacles" (p. 43). Well, you can't accuse him of mincing words. 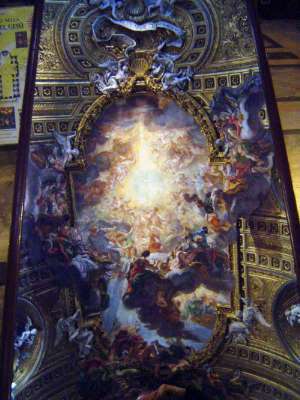 You can't say the Jesuits were lukewarm in their adoption of Baroque exuberance. The change came with the election of Giovanni Paolo Olive as General of the Order in 1664. 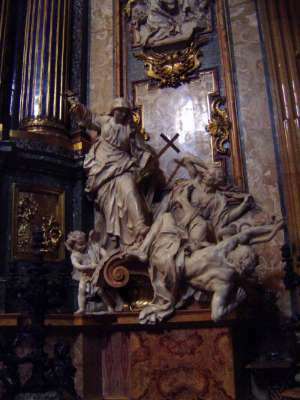 Nuñez writes, "Even this stern, capable cleric appreciated the theatrical and propagandist possibilities that the Baroque style offered, almost certainly because of his friendship with the sculptor Gianlorenzo Bernini" (p. 21). The Jesuits "now accepted that the arts could not only edify, but as has been remarked by other scholars, also delight" (p. 20). 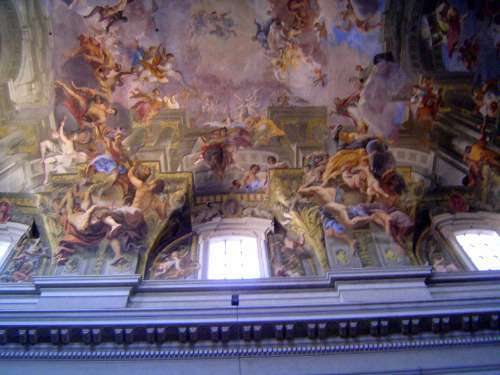 Accordingly, Olive chose Giovanni Baciccio (1639-1709) to paint the ceilings, and the results "represent a quantum leap forward from the Jesuits' earlier mediocrita religiosa" (p. 21). 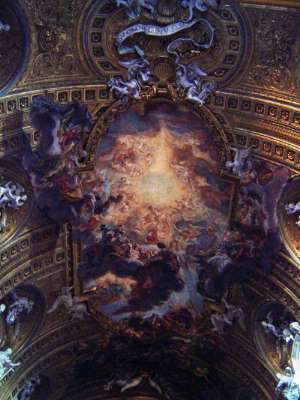 The nave fresco is entitled "The Triumph of the Name of Jesus," and the letters of the Jesuit seal (IHS) can be faintly discerned in the central blaze of light. The stucco figures were by Antonio Raggi and were apparently a response to a suggestion by the ever-fertile Bernini that the artwork extend outside its frame. Sullivan writes, "Refusing to be contained by its gilded framing medallion, the fresco bursts out to obliterate the surrounding architecture in three separate places: on the two sides, where the saved ascend to heaven in triumph, and at the crossing end, where the damned tumble down in agony" (p. 44). A mirror is positioned on the floor so visitors can see the ceiling without craning. Bursting the frame indeed, and very effectively. 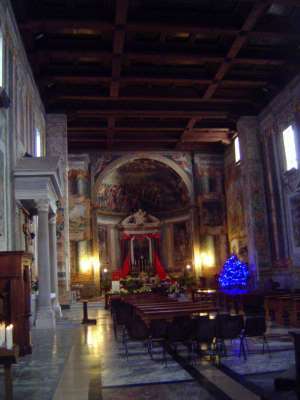 The left transept has the Chapel of St. Ignatius. 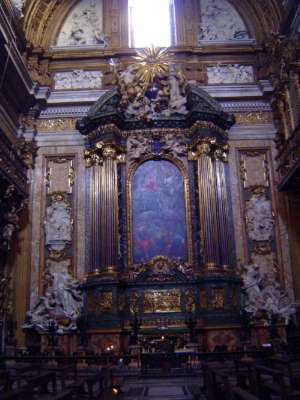 Blunt writes, "In 1696 the whole altar was replaced by a new one designed by Andrea Pozzo, one of the most sumptuous Baroque works in any Roman church." 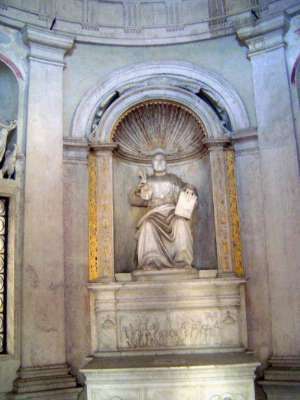 The sculpture at the top is "St. Peter Appearing to St. Ignatius at Loyola." 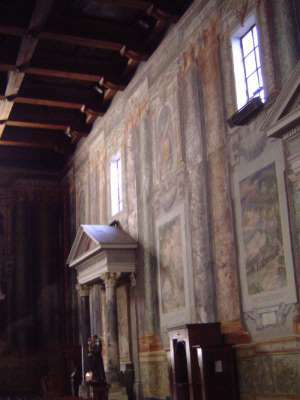 The panels to either side are reliefs called "Paul II Approving the Jesuit Constitution" and "The Canonization of St. Ignatius." The sculptural group on the left is "The Triumph of Religion over Paganism." On the right, "The Triumph of Religion over Heresy." 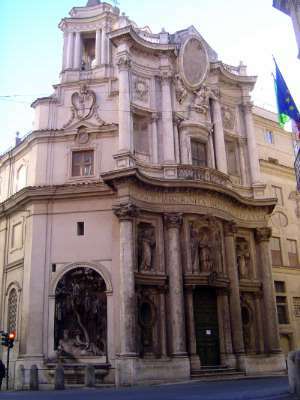 Just time for one more on this busy weekend: San Carlo alle Quattro Fontane, whose facade was added by Borromini in 1667, 30 years after the church was built. Grundmann writes, "There were no prototypes for this in ancient times. For the first time ever, the stone wall became an elastic material" (p. 209-10). Not everyone has been so sympathetic: Burckhardt's Cicerone compares the facade to apple peelings, and Keith Miller reminds us that the word "baroque" originally denoted deformity, which is why works like this, like those of Bernini, were condemned as "morally as well as aesthetically dubious" (p. 91). Alas, the door's locked. Have to wait for another cheap airfare.